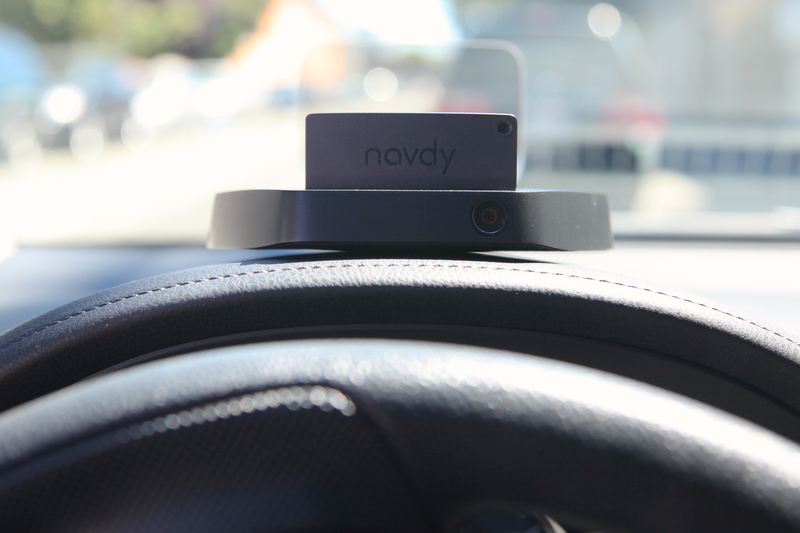 Navdy, a San Francisco startup planning to ship a dashboard heads up display in early 2015, is set to announce today a $6.5 million seed funding round that will be used to hire staff and prepare for manufacturing. Navdy actually secured the money before launching its pre-order campaign in August — a move that would allow the company to deliver the product even if had not received a large number of orders, CEO Doug Simpson said in an interview. He said he believes Navdy appealed to investors because it solves a familiar problem: using your GPS and phone while driving. The device sits on your dashboard and floats driving directions, notifications and other information seemingly on the road out in front of the car, reducing the need to look away from the road. A Navdy prototype. Photo by Signe Brewster. Unlike the large number of companies turning to sites like Kickstarter and Indiegogo in recent years, Navdy decided to do all sales through its own website. The $299 display, which will later retail for $499, has so far garnered $3 million in pre-orders. Upfront Ventures and LightBank led the funding round. Ludlow Ventures, AngelList, MESA+ I, LP, Eniac Ventures, Aslanoba Capital, Golden VP and Wareness.io also participated. Looking down at a smartphone or paper map is dangerous. This device is far safer. In fact this is better than looking down at your speedometer. Drivers do NOT need anything in their line of sight that will add to the distractions they already have. Driving a vehicle on the highway is NOT like flying a fighter jet through foggy mountains where the head-up display is ALL the pilot has to navigate. What do you think about using a HUD vs a dashboard mounted GPS or a phone? What is the best way for drivers to navigate and not be distracted? Drivers should NOT be looking at any of these devices. Learn where you are going so you can listen to GPS turn-by-turn directions without being distracted further. We have had near misses when drivers are on a phone or consulting a GPS or reading a map. Even with a GPS device, you have a screen. The only problem is that the screen is off center from the windshield. This causes drivers to look away when there are quick directions issued by the GPS. Now say if you have that display (transparent) in the center you are looking at the center, you are focusing on the road. I’m pretty sure you can temporarily turn it off if you feel the need. jets have been using HUD for years. It’s safer than glancing down at the instrument panel. People ARE going to use nav apps from their phone, it’s better to have it projected up. It’s inevitable technology, you could just as easily argue that covered wagons are safer than autos. Yes, I ordered one.